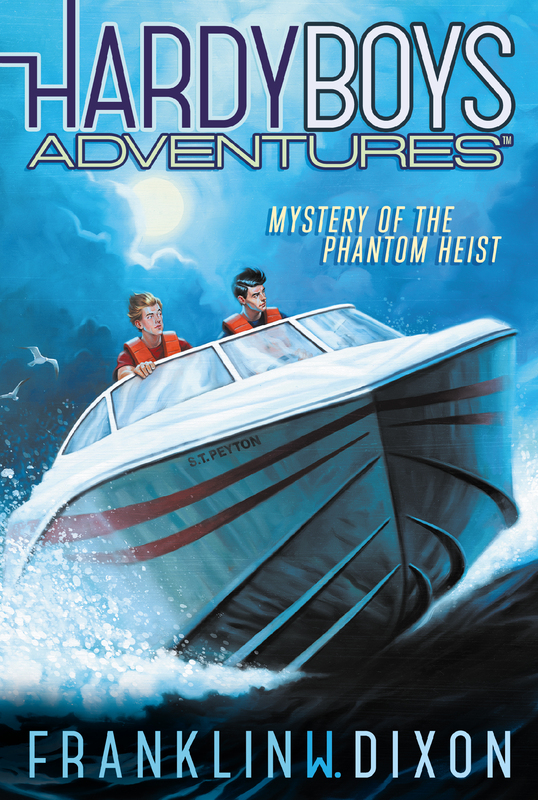 In this second book of a fresh approach to a classic series, Frank and Joe track down violent pranksters. Rich girl Lindsay Peyton is throwing the biggest and best Sweet Sixteen bash that Bayport has ever seen. But her party planning is off to a bad start when Frank and Joe discover that someone has keyed her very expensive car—an early birthday present—and has put the mean prank up on YouView. Soon after the prank goes viral, a group calling themselves the Scaredevils begin to film themselves committing acts of violent vandalism around town. Broken windows, Dumpster fires, and more threaten the security of Lindsay’s party—and of Lindsay herself. Frank and Joe are determined to figure out who is the mastermind behind the videos before Lindsay’s Sweet Sixteen turns into a party she will never forget…for all the wrong reasons. Help, I thought as my brother held up his prized possession, a tablet, for the gazillionth time. Not another lame clip on YouTube! It was the last thing I wanted to look at as we sat inside the swanky Peyton mansion. I wanted to check out the two slick cabin cruisers docked outside the bay window! Joe shook his head. “Check it out—it’s serious stuff,” he said, practically shoving the tablet in our faces. Joe knew what I meant. Our ages were only one year apart, but our personalities—worlds apart. Joe was always high-strung, fast-talking, and unpredictable. Me—I’m more the strong, silent type. At least that’s what I like to think. “Will you look at the clip already?” Joe urged. “I can’t keep it on pause forever.” He hadn’t put down that fancy new tablet since he got it for his birthday. I couldn’t really blame him. We couldn’t have smartphones until we were in college, so the tablet was the next best thing. It surfed the Web, got e-mails—even took pictures and videos. Speaking of videos . . .
Chet and I leaned forward to watch the clip. There were no skateboarding squirrels or sock puppets—just a clerk at a fast-food take-out window, handing a paper bag to a customer. The clerk looked about sixteen or seventeen. The person behind the wheel had his back to the camera, which was probably being held by someone in the passenger seat. The driver reached out to pay. But then he yanked the lid off his jumbo cup and hurled what looked like a slushie all over the kid at the take-out window! “Keep the change!” the driver cackled before zooming off. I could hear another voice snickering—probably the creep filming the whole thing. I stared at the screen. “Definitely not cool,” I said. “And a perfectly good waste of a jumbo slushie,” Chet joked. “Not funny, Chet,” Joe said with a frown. “How did you find that clip, Joe?” I asked. “Did they ever find the guys who did it?” Chet asked. “Yeah, but whose?” Joe asked. Of course, what Joe didn’t mention was that we were one wrong move away from reform school. No one knew about the Deal except our family, the police, and our former principal—who had his own issues to deal with now! “Before somebody comes in and sees it,” Chet added. “What would be so bad about that?” Joe asked. Glancing around the posh room we were sitting in, I knew Chet got the über-rich part right. “Check out the pool table, you guys,” I said. “As soon as I finish checking out those little beauties,” Chet said, nodding toward a nearby table. On it was a silver platter filled with fancy frosted pastries. I studied the portrait in the heavy wooden frame. The subject was a middle-aged guy in a blue blazer and beige pants. His hair was dark, with streaks of gray, and he was holding a golf club. I figured he was Sanford T. Peyton, the owner of the house, the boats, and the pastries. I didn’t know much about him, just that when the multibillionaire dude wasn’t living large in Bayport with his wife and daughter, he was opening hotels all over the country and maybe the world. The guy was crazy rich. And right now, crazy late! With that, Chet turned to another portrait hanging on the opposite wall. This one showed a teenage girl with light brown hair, wearing a white sundress and holding a Cavalier King Charles spaniel with huge eyes. “His daughter Lindsay’s Sweet Sixteen!” Chet declared, pointing to the portrait with a flourish. Chet and Joe were definitely psyched about this party. Too bad I couldn’t say the same for myself. “Got it!” I said with a smirk. The only thing I knew about Lindsay was that she didn’t go to Bayport High with Chet, Joe, and me. Which was no surprise. Chet cleared his throat loudly as the door swung open. Joe and I jumped up from our chairs as Sanford Peyton marched in, followed by his daughter, Lindsay. Walking briskly behind Lindsay was another girl of about the same age. She had long black hair, and her dark eyes were cast downward at her own tablet she was holding. As she glanced up, she threw me a quick smile. I caught myself smiling back. Hmm, I thought, still smiling. Maybe this job isn’t such a bad idea. “Have a seat, boys,” Sanford said as he sat behind his desk, facing us. Lindsay and the other girl stood behind Sanford, looking over his shoulders at us. As we sat back down, I could see Sanford studying the applications we’d filled out. “I see you all go to Bayport High,” he said gruffly. “Daddy, they’re cute, but not gladiator material,” Lindsay cut in. The three of us stared at Lindsay. “Say what?” Joe said under his breath. “There will be no pigs in blankets at this party, boys,” Sanford said. “What kind of a party has no pigs in blankets?” Chet asked. Sanford folded his hands on the desk. Joe, Chet, and I stared at Lindsay as she flipped her hair over her shoulder. Was she serious? So her name was Sierra. Nice name for a nice-looking girl. I watched Sierra busily taking notes until Sanford’s voice interrupted my thoughts. “You mean those sheets the guys in ancient Rome used to wrap themselves up in?” Chet asked, wide-eyed. I glanced sideways at Joe, who didn’t look too thrilled either. Was this Sweet Sixteen really worth it? But when I turned to look at Sierra, I got my answer. You bet! “I’m sure we can get togas,” I said. “Or some white tablecloths from our mom,” Joe added. Lindsay tapped her chin as she studied us one at a time. She pointed to me, then to Joe. “Those two can be waiters,” Lindsay said. Sanford didn’t even look at Chet as he went on with the party details. “My outfits!” Lindsay cut in. I glanced over at Chet, who looked like he’d just been kicked in the stomach. I wasn’t sure whether Sierra or the Peytons had heard Joe, and I didn’t want to find out. All I wanted to do was get out of that house ASAP! As we walked to my car, I had no trouble forgetting about Lindsay, but Sierra kept popping into my head. Then, as if Joe had read my mind . . .
“I saw you watching that Sierra, Frank,” he said with a grin. “You never miss a beat, do you?” I smirked. Leaving the sprawling Peyton mansion behind us, we walked down the flagstone path toward the private parking lot. I could see my car in the distance right where I’d parked it. But before we could get to my secondhand fuel-efficient sedan, we had to pass a parking lot full of luxury SUVs and sports cars. Joe pointed to a red sports convertible whose vanity plate read LUV2SHOP. “I’ll take a wild guess and say that one!” he chuckled. Chet whistled through his teeth as we went to check out the shiny car. The top was down, so we got a good look. “Yeah, and I’ll bet that’s a heated steering wheel,” Chet added. “That’s not all it has, you guys,” Joe called. Glancing up, I saw my brother staring at the car door. He didn’t look impressed. Just dead serious.